Remove leftover cutting and engraving bits from the floor and the crumb tray whenever there is a buildup. Bits on the tray can prop your material up in the air, and a buildup of cutting and engraving bits can create a fire hazard. To remove the crumb tray, lift the lid, then swing down the front door. Lift the crumb tray slightly and slide it towards you. Be careful not to tilt the crumb tray up, or it will knock into the printer head and rails. Tilt the tray handle side down over a trash bin and empty out all the tiny remains of past projects that have fallen through the metal grid. If necessary, turn the tray upside down and shake out anything that's left. Use cotton swabs to gently remove bits that get caught. Be careful not to bend the grid. 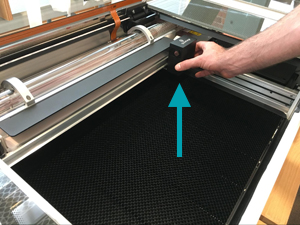 Wipe the metal floor of the Glowforge unit with a soft cloth to sweep away any bits. Pay special attention that the four dimples where the crumb tray sits are clean. If anything sits in those dimples, the Glowforge printer may not be able to focus correctly, and the camera will be out of alignment. Return the crumb tray to the original location, sliding it in horizontally. Be careful not to contact the printer head or the rails. When it is in place, the tray’s four feet will drop into the small dimples and it will no longer slide. After every 40 hours of printing, use ZEISS lens cleaning wipes (available on Amazon and many other stores) to clean the cameras, laser lens, and windows. This will keep the unit working properly and prevent permanent damage to your unit. Turn off your Glowforge. 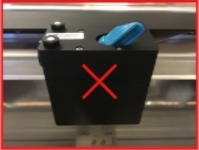 Grasp the printer head as shown, and pull gently up and back to disengage the magnets and remove it. Turning the printer head over, use a ZEISS cleaning wipe to gently wipe the small window on either side of the lens. Gently insert the lens tool into bottom of the head with the “Remove” arrow pointing in. When you hear the magnet click, withdraw the tool and the lens. Gently slide the lens off the lens tool and wipe both sides with a lens wipe. Be careful to touch only the metal ring to avoid fingerprints on the lens. Flip the lens tool until the “Install” arrow points up. Set the lens down on the lens tool. The open side goes away from the blue plastic, so it looks like a bowl on top of the tool. It will sit firmly on the tool and will not wiggle. Slide the lens tool up into the printer head until the magnet clicks, then remove the tool. Review instructions for snapping in your printer head, then put the head back on. Wipe the window on the left side of the head. Carefully reach over the left rail and wipe the laser window on the left side of the bed. Finally, gently wipe the lens of the wide angle camera on the unit’s lid. It’s normal for some dust to accumulate inside your Glowforge. It is not necessary, but you can wipe the laser tube or the inside of the case with additional ZEISS cleaning wipes. 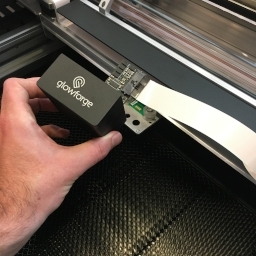 Allow any moisture to dry completely before turning on your Glowforge again. After approximately every 120 hours of printing, use ZEISS lens cleaning wipes (available on Amazon and many other stores) to clean the mirror in your Printer Head. 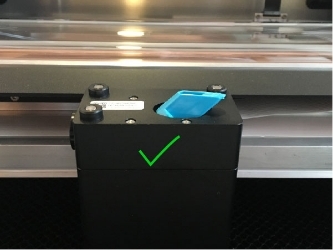 The top of the Printer Head is held on by strong magnets. Grasping only the top, pull up carefully to remove it and set it aside. Be careful not to touch the mirror surface with your bare fingers. Using a Zeiss wipe, gently wipe the surface of the mirror. Use several passes until the mirror is clean, each time moving to an unused portion of the lens wipe. If the mirror has a spot in the middle of it after cleaning, or is generally unable to be cleaned to a reflective finish, it needs to be replaced. Please take a photo, share it with us, and skip the rest of these instructions. 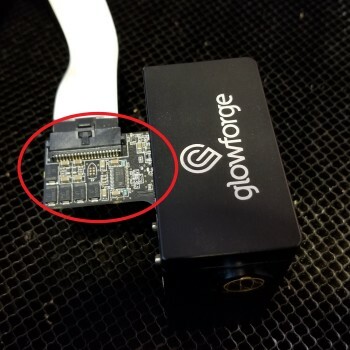 Replacing the mirror incorrectly can permanently damage your Glowforge. Fortunately, we designed it to be easy! 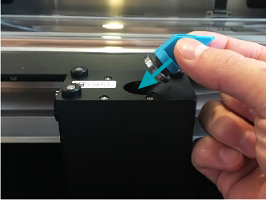 Hold the mirror by the handle and gently slide it into the notch with the mirror at a 45 degree angle to the top of the Printer Head. The Glowforge logo on the handle will face up and sit parallel to the floor. It will rest softly in place - there is no need to push it in. This will help ensure that the mirror is resting properly in place. Follow the instructions to remove the Crumb Tray for access to additional surfaces. Do not remove any other parts and do not loosen or remove any fasteners. 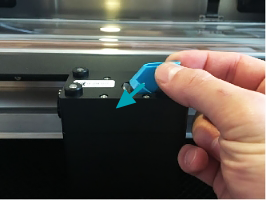 Grasp the Printer Head as shown, and pull gently up and back to disengage the magnets and remove it. Review instructions for snapping in your Printer Head, then put the Printer Head back on. Use both hands to gently move the laser arm to the front of the bed. You’ll see the circuit board on the left side of your unit. Use canned air to blow the dust away. Use both hands to roll the laser arm back to the middle of the bed. If you want to use Isopropyl Alcohol, spray it on a lint-free cloth, then wipe debris away with the damp cloth. Never spray liquid on or in your Glowforge printer. Wait for your Glowforge unit to dry completely before turning it back on. Squeeze the two ends of the ring clamp together and pull the clamp and the hose away from your Glowforge to remove them. 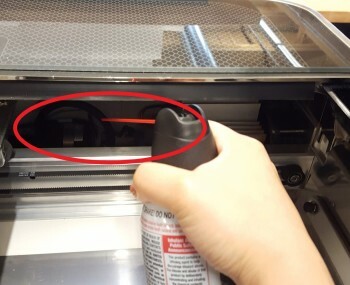 Use a vacuum to remove dust and debris from your Glowforge unit’s exhaust connection as well as from your outdoor exhaust vent. First rinse your pro glasses in water to remove debris, then use a Zeiss wipe to remove any oils that the water doesn't wash away.